A compilation of 'A Day' when Sachin announced his retirement from International test match cricket. 10/10/2013 (10th October 2013) When Sachin announced his retirement. The announcement by master blaster Sachin Tendulkar about his retirement from the cricket test series after playing his 200th match truly broke millions of heart. The god of cricket will be missed by each and every cricket lover for sure. Sachin's retirement will be the end of an era. All the Sachin fans and who know Sachin believe that there can't be any other cricketer like him. For a star-starved nation disgusted with tainted politicians and mediocre sportsmen, Tendulkar's self-discipline, fiercely private family life and controversy-free image make him a role model for the country's burgeoning youth population. He has remained a conservative family-orientated person despite the glare of a perpetual spotlight and, unlike some of his teammates, he is rarely seen on the party circuit. He is a role model for a generation of cricketers. He is a cricketer youngsters can learn so much from. Just learn from the way he has dedicated his life to cricket. 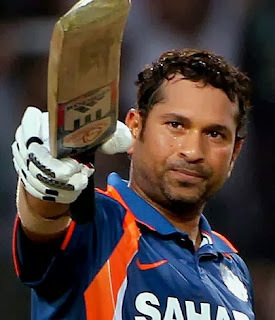 A cricket commentator once described Tendulkar as India's greatest unifier since Mahatma Gandhi. Not too far off the mark as 'the God of cricket', as fans call him in India, managed to glue together a fractious parliament, whose members all thumped tables to welcome him as a member of the upper house Rajya Sabha last year. When he was gifted a Ferrari, the country's government went out of its way to waive off the hefty import duty for India's favourite son. Everytime whenever any suggestion that he should step down to pave the way for youngsters in the Indian team is met with irate reactions from his worshipping fans. Over the years there have been a few critics who felt he had concentrated too much on personal targets but Tendulkar has never let criticism or negative headlines breach his defence. "If people throw stones at you, turn them into milestones," he famously said after overtaking Brian Lara as the highest scorer in Tests in 2008. No cricketer has shouldered a greater burden of expectations than Tendulkar and for many an India match ended whenever he got out. Since unsuccessful stints as national captain, Tendulkar has eased into the role of senior player and he was instrumental in Mahendra Singh Dhoni's elevation to the post of India captain. Virat Kohli on Tendulkar's contribution to Indian cricket. "Sachin Tendulkar has carried the burden of the nation for 21 years. It is time we carried him on our shoulders," he said, after the Indian cricketers completed a lap of honour with their master batsman on their shoulders following India's World Cup win at home in 2011. You can`t compare anyone with Tendulkar- Shahid Afridi. "All my life, I have had a dream of playing cricket for India. I have been living this dream every day for the last 24 years. It's hard for me to imagine a life without playing cricket because it's all I have ever done since I was 11 years old. It's been a huge honour to have represented my country and played all over the world. I look forward to playing my 200th Test Match on home soil, as I call it a day. I thank the BCCI for everything over the years and for permitting me to move on when my heart feels it's time! I thank my family for their patience and understanding. Most of all, I thank my fans and well-wishers who through their prayers and wishes have given me the strength to go out and perform at my best."